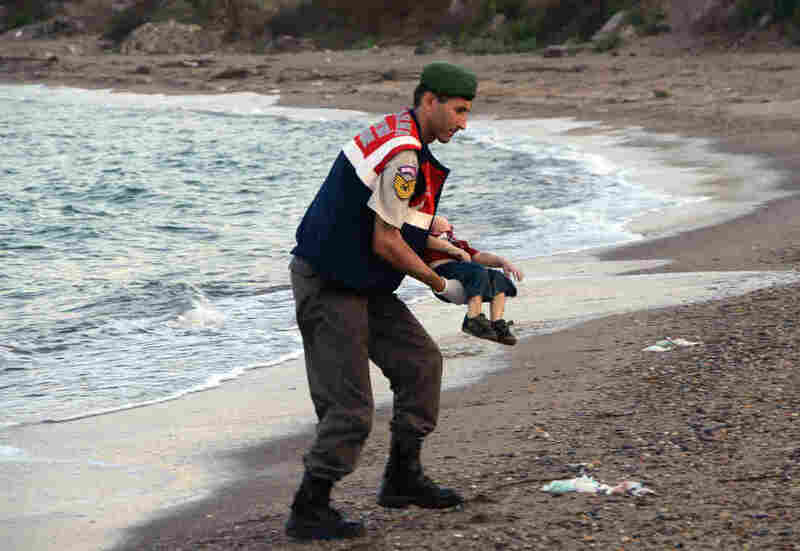 That Little Syrian Boy: Here's Who He Was : Parallels A photo of a drowned Syrian toddler on a Turkish beach sparked anguish and outrage over the handling of the world's migration crisis. Editor's Note: The photos in this story may be distressing to some viewers. The original version has been updated to include additional details. A Turkish paramilitary police officer carries the body of 3-year-old Aylan Kurdi, found washed ashore near the Turkish resort of Bodrum early Wednesday. The boats carrying the boy's family to the Greek island of Kos capsized. His 5-year-old brother and mother also lost their lives. The numbers associated with today's migration crisis are huge: 4 million Syrians fleeing their country; 3 million Iraqis displaced. But it was the image of a solitary child — a toddler in a red T-shirt, blue shorts and Velcro sneakers, found face-down on a Turkish beach — that shocked and haunted the world this week. The photo, which first appeared in Turkish media, sparked outrage, distress and no small amount of soul-searching. It was widely shared on Twitter with the hashtag, "KiyiyaVuranInsanlik" — Turkish for "Humanity Washed Ashore." The drowned boy was 3-year-old Aylan Kurdi, from Syria, part of a group of 23 trying to reach the Greek island of Kos. They'd set out in two boats on the 13-mile Aegean journey, but the vessels capsized. Aylan Kurdi's 5-year-old brother, Galip, also drowned, as did the boys' mother, Rehan. Their father, Abdullah, survived. In all, five children from that journey are reported dead. "The Turk [smuggler] jumped into the sea, then a wave came and flipped us over. I grabbed my sons and wife and we held onto the boat," Mr. Kurdi said, speaking slowly in Arabic and struggling at times for words. "My wife is my world and I have nothing, by God. I don't even think of getting married again or having more kids. ... I am choking, I cannot breathe. They died in my arms." According to the Globe and Mail, the family, Syrian Kurds, had lived in Damascus, where Abdullah Kurdi was a barber, until 2011. After Syria's war began, they moved to Kobani, a city along the border with Turkey that has been contested between ISIS and Kurdish fighters and has undergone hundreds of airstrikes. There has been confusion and conflicting reports about whether the family had applied for legal migration as refugees to Canada, where Abdullah Kurdi's sister, Teema, lives and works as a hairdresser. Peter Bouckaert, emergencies director at Human Rights Watch, told NPR's Steve Inskeep the application had been denied. But Canadian media, citing the Department of Citizenship and Immigration, reported there was no such application. "There was no record of an application received for Mr. Abdullah Kurdi and his family," according to a statement attributed to the government. Why Are Migrants Surging Into Europe Now? An application had been received for his brother, Mohammed Kurdi, and had been "returned as it did not meet regulatory requirements for proof of refugee status recognition." According to the Globe and Mail, Abdullah Kurdi told Radio Rozana he'd paid about $6,100 to ensure places for his family on a 15-foot dinghy. They were among a dozen passengers making the journey in that vessel. Bouckaert was among many who shared the photo of Aylan Kurdi on Twitter. "What really touched me was the little sneakers," he says. "I'm a father of two boys myself. ... I realized that his parents had dressed him that morning for a very difficult journey." Bouckaert acknowledges that "it's a very disturbing photo, but I think we should be offended that children are washing up dead on our beaches because of the failure of our politicians to provide safe passage ... rather than by the photo itself." In Britain, where just 216 Syrian refugees have been accepted so far, reaction to the photo put Prime Minister David Cameron on the defensive. "We will do more," he said Thursday. The United Nations estimates that some 2,500 people have lost their lives on risky sea journeys as they try to escape violence and repression at home. Like all numbers associated with the migration crisis, this one can be hard to fathom. But the message of Aylan Kurdi's photo seems clear enough: The world needs to do better in addressing migrants' needs, safety and dignity. "We really need a wake-up call that children are dying, washing up dead on the beaches of Europe, because of our collective failure to provide them safe passage," Bouckaert says. "People fleeing Syria are legitimate refugees, and they should be welcomed in Europe and the rest of the world."